Aside from people who get motion sickness, with 3D action games, there are quite a few people who get lost within the playing field, because they can't figure out which way to go next. And there are also a good number of people who feel like 3D games aren't made for them. In releasing this 3D Mario game, what did you do to try to cater to these people? Aside from people who get motion sickness, with 3D action games, there are quite a few people who get lost within the playing field, because they can't figure out which way to go next. basic action is the A Button jump. However, on a spherical map, it's pretty difficult to try to jump and stomp on an enemy. Koizumi-san even went as far as saying "Making the characters jump in a 3D action game is absurd.". spin . With this move, you're able to tell the distance from the target even when the camera is looking straight down from above, making it easy to defeat enemies. You can knock out an enemy by spinning, and from there you can take your time to jump and stomp your enemy. During the early stages of development, the spin was activated by rotating the Control Stick on the Nunchuk. But during the development process, it was decided that a tilt sensor was to be included in the Wii Remote. So we changed the spin so that it could be activated by a slight shake of the Remote. This way, the gameplay has become more intuitive, even for those people who usually don't play video games. In a 3D action game, the most basic action you do is running. While you are running, the easiest way to attack is not by jumping, but by spinning. So in Super Mario Galaxy, running and spinning are the basic actions. So it's not a game about jumping? But thanks to the advice from Miyamoto-san, I think we were able to tighten everything together nicely. Bullet Bills , which must be guided towards objects to destroy them. This can be easily done by simply moving the Control Stick on the Nunchuk. But if you make it so that it requires you to press the jump button at the same time, it gets a little difficult. Even for things like this, we made it thinking about our customers who will be playing for the first time. This can be said for all the Mario games, but the games' fun factor is actually similar to the experience you get playing sports! (laughs) When you're first given a task and someone tells you "OK, try this action! ", it's really difficult to be able to do it on the first try. And when you fail, you can almost hear a voice from above saying "Come on! One more time!". (laughs) You keep pushing yourself in this way over and over again, and when you finally clear it, the sense of achievement is like no other. But lately, I think the number of people who just give up right away has increased dramatically. They just say, "I can't do this". On top of that, there are an increasing number of people who think that 3D action games aren't for them, without even giving them a chance. What has been done to appeal to this audience? I think our response to that problem was the inclusion of the two player mode, where two people can play cooperatively. The Co-Star mode. Actually, the cooperative mode in a video game is something that I feel particularly strong about. Miyamoto-san was the one who made the original Mario Brothers8 game, so it seems like every time he worked on a new Mario game, he was thinking of new and fun ways to implement a simultaneous two player mode. But it just hasn't worked too well. That's what he had told me while I was working at HAL Laboratories9. It was about the time that I was working on Kirby’s Fun Pak10 for the SNES. Back then, he told me "Kirby games move at a slower pace than Mario games, so I think they’re suited for two player co-operative gameplay". When I heard that, (Masahiro) Sakurai-kun11 and I wondered, "why does Miyamoto-san raise topics that he can't work out himself?" (laughs) Thinking about all the struggles we went through back then, making this game must have been quite a challenge. 8 Mario Bros. is an NES game that was released in Europe in September 1986. 9 HAL Laboratories is the software company that worked on such games as Kirby’s Fun Pak, and Smash Bros. 10 Kirby’s Fun Pak was released on the SNES in Europe in January 1997. 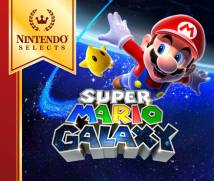 This game had a two-player cooperative mode – a first for the series 11 Masahiro Sakurai is the director of games such as the Kirby series and the Smash Bros. series. 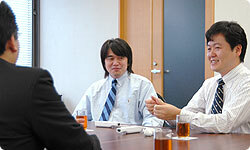 He has since left HAL Laboratories, and is currently working on Super Smash Bros. Brawl for Wii. Co-Star mode , if you're the experienced player, you're able to stop rolling boulders and enemies with the pointer to help the inexperienced player, or the inexperienced player can take on the assisting role and enjoy themselves simply by collecting Star Bits. You can also use the on-screen pointer to indicate which way the main player should go, and have fun talking to each other while playing. At first, I was thinking about designing it so that both players would take on similar roles. But it became hard to decide on how that should be executed. 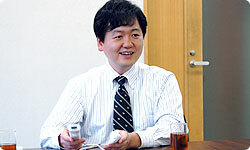 But Miyamoto-san sorted things out for us, and it became a feature that worked great for novice gamers. I heard one of the staff members who isn’t very good at action games talking about how much fun it was playing with the Co-Star mode. What kind of things did Miyamoto-san sort out? He said "Let's make it so that you're able to do things in the two-player mode that you're not able to in single player". He also said it's best to draw a clear line between the single and two-player modes. Until then, you were able to stop boulders using the pointer in single player mode as well. But once we changed it so that it could only be done in two-player mode, the game worked great; it really balanced things out. If you were still able to stop boulders in the single player mode, I think it would have ended up being a completely different game. But before you made the decision to clearly differentiate these two modes, things really must not have been organized. It wasn't good at all. 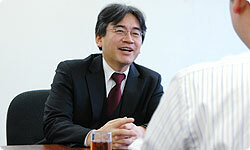 However, just by Miyamoto-san saying "let's draw a line", everything started coming together.